We arrived in Pendleton, OR around 7PM last night after taking our time driving down the Columbia River Gorge, which is one of the most beautiful places on God's green earth, in my opinion. We never drove over 40 mph down the Scenic Highway and at most times we were only going 25-30 mph. You have to go slow to take in all the beauty, especially if you want to take pictures. We took a few hundred (yes, HUNDRED) photos on the way and I will post some of them later today. Right now, I have just finished the weekly CSS broadcast at a little coffee shop in downtown Pendleton and I am heading over to watch a parade with Kristin and some friends. Talk to you later. 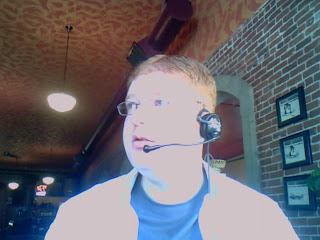 Me broadcasting from Great Pacific, a coffee shop in Pendleton.